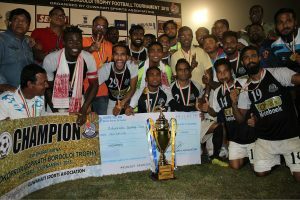 Home / Indian Football / Second Division League / Mohammedan Sporting beat Oil India FC to win 65th Bordoloi Trophy! Charles Atcha put the Black Panthers ahead in the 26th minute before Philip Adjah scored twice in the 58th and 62nd minute, while Milan Boro pulled a goal back for Oil India FC in the 87th minute. This is Mohammedan Sporting’s sixth overall Bordoloi Trophy title and their first since 1991. Mohammedan Sporting were awarded Rs. 300,000 (3 lakhs) and the Bordoloi Trophy while Laltu Mondal and Philip Adjah were as the Best Goalkeeper and Man of the Tournament respectively. The entire Mohammedan Sporting squad has dedicated this victory to the memory all those Bengali people who were killed in Assam recently. Previous India Women open 2020 Olympics Qualifying campaign with 1-1 draw against Nepal! Next VIDEO – 442oons: Juventus FC 1-2 Manchester United – Match Highlights (Parody)!